Lunch boxes for office have always been serious business. They made history in service industry by just collecting the lunch boxes from homes of office goers and delivering them to their offices, the Bombay Dabbawalas are now a case study at Harward Business School. We Indians want home cooked food everyday even though we have become more and more experimental. Home cooked comfort is unparalleled. The kind of mails and comments on blog and instagram I am getting, I understand the most loved lunch boxes will be the desi types. Roti subzi in the north and idlis and different types of rice preparations in the south are the kind of meals loved by adults in their office lunch boxes. School going kids prefer more fancy stuff but adults always want better value for the effort. Also, for most of us lunch time is crucial because this is the first meal of the day that we eat at leisure and yet we want to call it a working lunch. Breakfast for most of us is a hurried affair. Incidentally for myself, breakfast is late and often makes a brunch which is mostly the stuff I pack for the husband, that makes me test the lunch box about any spoilage or change in taste or texture. I learnt a few things regarding avoiding food spoilage and change in texture etc in packed lunches since I started packing lunches for both of us technically. All raw salads have to be simple as there is not much time to chop and mix ingredients and dressings but the raw food has to be tossed with a little vinegar to avoid any spoilage. Rotis have to be folded while still hot and packed into the lunch box to keep the soft. Applying some butter or ghee helps retain the texture better. Don't carry any curries that may leak accidentally or may spill when opening the lunch box. Quick dry stir fries with minimal spicing works best as it gets ready quickly and stays fresh to be eaten after a few hours. Get the lunch boxes washed really well and rinsed with hot water everyday if they are not being machine washed. Any remaining bits of food will breed microbes and cause spoilage of food the next day. Grooves of the lids are to be watched. The cut fruits should be placed in the office refrigerator immediately after reaching or should be meant for the mid morning snacking. Cut fruits should not be kept for more than a couple of hours. Smaller fruits should be carried whole, only pineapple, papaya, melons etc can be cut and packed, preferably with a little lime juice to prevent oxidation. Apart from this, invest in good quality lunch boxes and have a few sets of them for different types of foods you carry. I use a few glass containers with plastic fitting lid for yogurt and raw salads and find them very convenient to retain the taste and aroma of raw foods and any slightly acidic foods. The glass storage boxes from Luminarc and Borgonovo are great as they have a good tight filling plastic lid. I like stainless steel lunch boxes too as the food doesn't spoil and can be reheated in the old fashioned office ovens that most Government offices have. 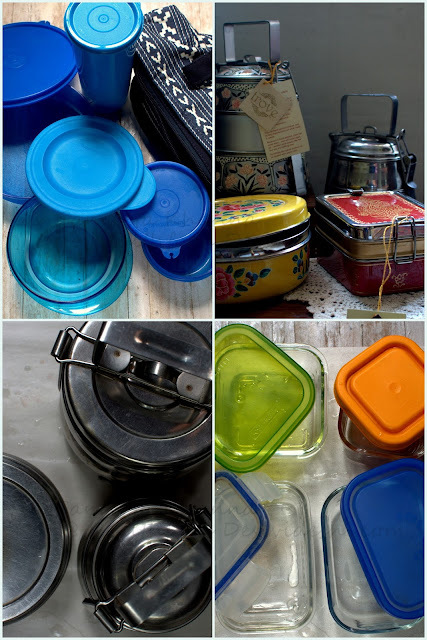 Some plastic lunch boxes form Tupperware are good only for the foods that can be eaten without reheating. I generally avoid microwave reheating in plastic, glass is better for MW cooking or reheating. These stainless steel lunch boxes are from Trove, hand painted on the outside, making them look good, making lunch time a bit of fun. The paint doesn't come in contact with food so there is no worry of leaching of any chemicals. I believe in eating loads of seasonal vegetables so you will see I do some effort in cooking the vegetables and packing generous quantities too. It helps that I have a help for chopping the vegetables the previous day. I have provided quick subzi recipes typed in italics or have provided links to the subzi recipes. This ghee fried peppery okra in the lunch box below is a favourite and we treat it as a salad more. The other white gravy curry is a plain lauki (bottle gourd) cooked with coconut milk that we both love. It take about 10 minutes to cook 2 generous portions. Just pressure cook the diced lauki (600 gm) with 1/4 cup water and salt to taste, add 150 ml coconut milk and give a quick tadka of mustard seeds, dry red chillies and curry patta. It helps when the subzi in the lunch box is simpler in flavours, as the flavours stay fresh even after 3-4 hours. More complex spicy curries may taste good to some, but they will make the lunch area quite smelly for others when one is eating lunch. We might not like to spread the aromas of our lunch box in a common dining room or even a private room where the aroma may stay on. 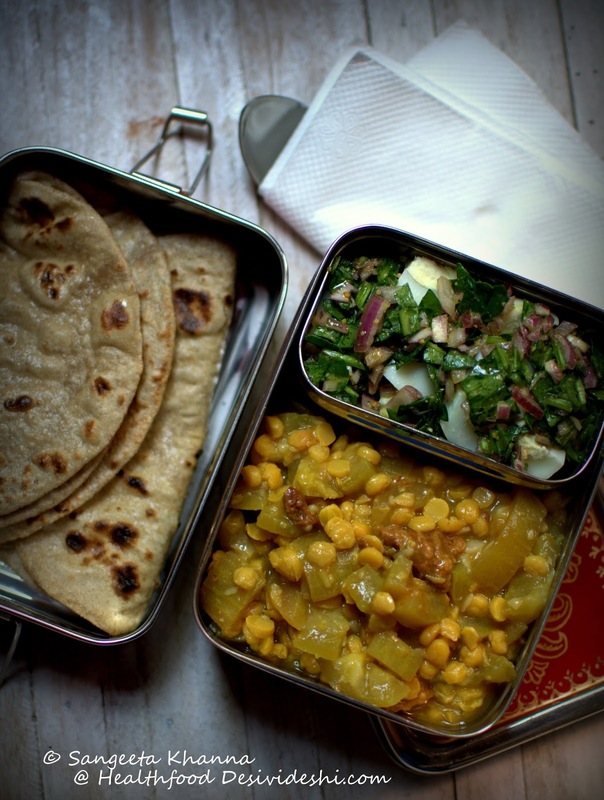 The other roti subzi lunch box has a Lauki chana daal subzi with Amritsari vadi and a garden salad with boiled eggs. The salad is just chopped red onions and raw spinach from garden tossed with kasundi (Indian mustard sauce) and poured over chopped boiled eggs. This way the eggs don't smell. The subzi again takes some 15 minutes to cook. Heat mustard oil, add one Amritsari vadi (broken) into hot oil and fry till fragrant. Add a little turmeric powder, peeled and diced bottle gourd (500-600 gm bottle gourd), salt and soaked chana dal(3-4 tbsp soaked daal). Toss well to mix, add 1/2 cup water and pressure cook. This subzi looks like a lot of effort but cooks quickly and tastes great to if you like Amritsari vadi. The good thing is, that the vadis have all the flavorings of real spices and some chillies so you don't need to add any to the subzi. This lobiya subzi with Amritsari vadiyan is almost similar and can be great lunch box subzi too. Another subzi with Amritsari vadi is with Turai (sponge gourd that I made in similar fashion, with or without chana daal. See in the next lunch box. The other white gravy curry is a poppy seeds onion curry called peyaz posto with some paneer cubes. 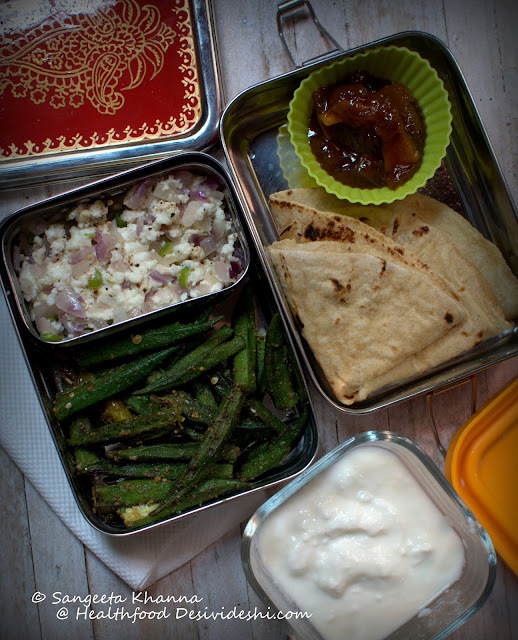 Adding paneer or eggs to the lunch box makes it easier to balance. This 10 minute kasoori methi paneer will be great for lunch box. The celery tomato paneer bhurji, or another celery paneer also makes a great option or try this drumstick greens tomato and paneer curry for lunch box. Another okra stir fry is made in just 5-6 minutes using pre cut whole baby okra. Just heat a little mustard oil, add a slit green chilly and dunk in the baby okra. Toss and stir fry for 3-4 minutes and sprinkle some yellow mustard powder, pepper powder, garlic powder and a little amchoor powder or lime juice. This one also serves as a salad and also tastes great when wrapped in plain rotis. There is some quick paneer bhurji in this lunch box that also takes less than 5 minutes if you have pre cut onions and green chillies. To make this one I just use the pan which was used for the okra stir fry or any other stir fry that I made that day, no extra oil required. Just saute the green chillies and onion for a minute, add crumbled paneer, salt and pepper and scramble for a minute or till the paneer gets heated thoroughly. Pack as required. There is some khatta meetha aam ka achar in the silicon muffin liner. These muffin liners are great to pack something extra in the lunch boxes. There are many everyday subzi recipes you can follow and suit them to pack in the lunch box. Some more stir fry vegetables and stir fry salads form this blog can be adapted for lunch boxes. 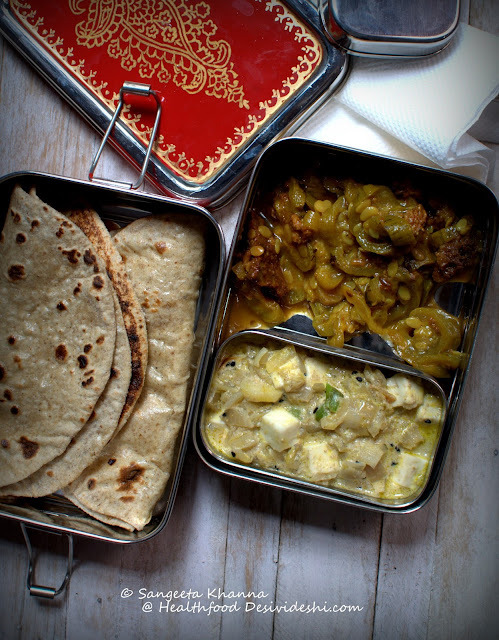 I love lotus stem curries and raw plantain too for room temperature meals akin to lunch box. The rotis are always multi grain or at least a mix of barley flour and besan (chickpea flour) and we do like a generous smear of ghee on our rotis whenever we eat them. 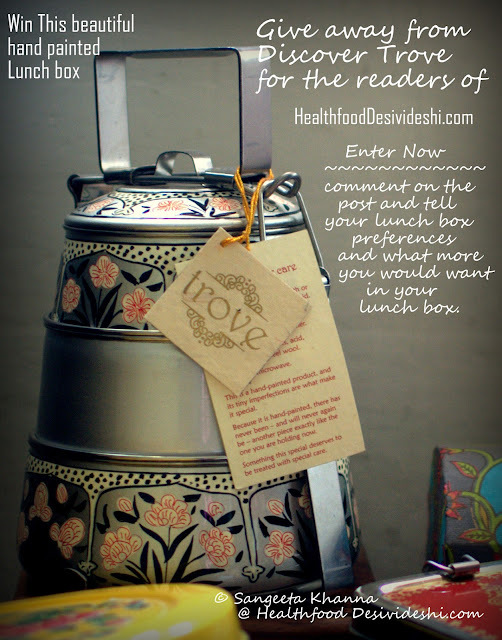 I am planning to share some chutneys, sauces and quick salads suitable for lunch boxes in this series, as suggested by Ritika Kapoor in the comments section of last post. I understand that having some home made sauces and chutneys can be very convenient in planning lunch boxes for both adults and kids. I am glad there are more people who don't want to eat bottles sauces and chutneys and want to make the effort for getting the right thing. I am announcing another give away in this series. 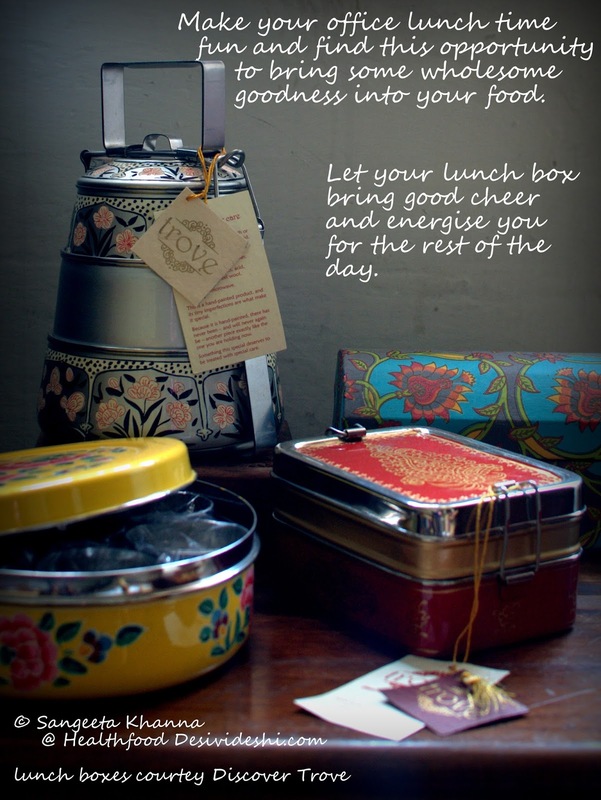 This time it is a 3 tier hand painted lunch box from Trove, I am sure it will make your lunch box even more interesting or you can even use this box to store some dry snacks at home or at your office desk. To enter to win this give away you have to tell me what are your lunch box preferences generally and what more you would want to have everyday. Write your suggestions and your mail id in the comment section of this post and enter a chance to win this beauty for yourself. The give away is open till the end of July. Keep telling me more about your lunch box requirements. You can find me on Facebook, instagram, Twitter and Pinterest. Follow me there if you like what I do and keep giving me feedback as that is how you get to see what you want here. This giveaway is open till the end of July 2015, applies within India, apologies for not being able to ship worldwide. Please provide your mail id in the comment section so I can get in touch with you. I am always impressed the way you put your thoughts in these posts. To the point and quite practical. Keeping the fruit box and main lunch box is better because slightly warm main lunch box may cause spoiling of the fruits. Having a small carry bag to fit in all the small boxes and spoon will be a good way to remember carrying all of them. Hi Sangeeta! I am a homemaker currently in Canada. Have to pack at least 6 boxes lunch and snacks for my husband, son and daughter. I usually run out of ideas for different types of salads which stay good in box and healthy snack ideas for their evening snacking. Though I try to incorporate lots of fruit in their diet, I want to have them more of raw greens and sprouts. Please help us with this. 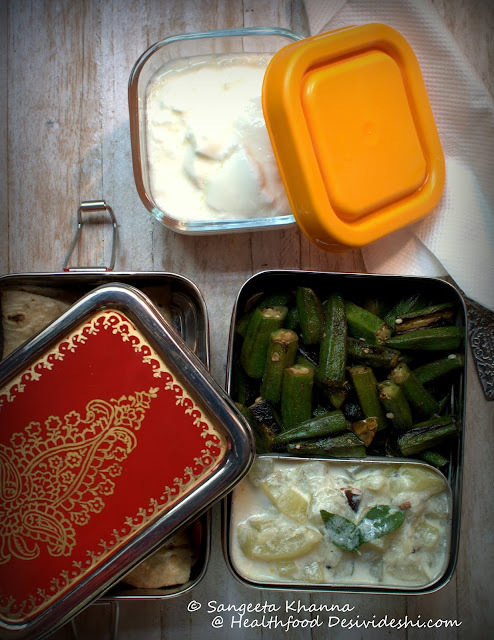 As u are aware, i need to prepare two entirely different lunch boxes, one for the son, who gets a quicj grab of the mixed rice, in the minimum time available, and another for the husband who needs a complete, rice,sambar/rasam/ kootu and a poriyal with curd. In both cases reheating is not possible and so often the food gets cold on a winter day .Tnis is an interesting series giving a complete idea of how to cook fast, conveniently without combersome procedures and in what quantity, I would love u to cover it region wise too, so that readers across the country can relate to it easily. Expecting the interesting series everyday. I have always known folks who carried dry chutneys in their purses in these small tight fitting dabbas. A family member often carries dry kadhipatta-sesame-roasted chana -red chilly chatni, or even just a small bottle with roasted melon seeds , with turmeric added while roasting. Apart from giving you a change of taste on garnishing the sabji /salad, it s a nice thing to munch on in the office if you feel hungry working late etc etc. Better than wadas and stuff na ? Thank you Suranga. Yes I have a few of those small steel dabbas for chutney. We carry those dry chutneys an roasted seeds and nuts when traveling but for everyday lunch boxes Arvind wouldn't remember to mix anything :-) I love those dry chutneys though. Some of the salads we find more convenient with nuts and seeds and keep repeating them. Hi, I'm Divya from Hyderabad. I love your blog. I have used several of your recipes in my cooking. Can you please post different varieties of rotis and parathas with different flours? I feel they are ideal for lunch box and healthy too. Suggestions for vegetables that pair best with such rotis are also welcome. Thanks much! Thanks Divya, all the rotis pictures here are made of mixed grains like amaranth, jowar, barley, chickpea flour and whole wheat. Sometimes it is just barley and whole wheat and sometimes barley and chickpea flour which is called as jauchana atta in UP. Jauchana or Jauchan atta is the mix I stock always, other flours I keep separate and mix and match everyday. There is a detailed recipe of ragi roti on bananaraskakhana.com , my other blog. Will try and post more. This is a good point you have brought up on using plastic lunchboxes.. carrying any curry / daal /oily recipes in these plastic boxes leaves a smell (if you heat them in a Microwave) that doesn't go away even after multiple washes... and this happens with the best of brands.. i've invested lately into some steel containers which just have a plastic airtight lid.. While I can't heat it, i've found the food is much more fresh even after 4-5 hours of packing.. Thanks Piyush. Yes plastic lunch boxes however good quality, are not suited for frequent reheating. Steel containers are great. I love this treasure trove, and love that you decided to address the lunch box issue. Such an uphill task on most days. I'd love to see some salads, veg and non veg, with dressings to match. Sangeeta, when you make a post on salads, it would be great if you would also address how to store those greens (cleaned or chopped) for easy usage & longer duration. Not everyone has the luxury of plucking it fresh from the garden :). On thing that I always struggle with is that those greens always get wilted or dry or stale (unusable) if I keep them for a longer time and I end up throwing them. And its not always possible to get them fresh. Thanks. Good point Puja. Thanks for reminding me, will include pointers for using, storing and purchasing greens also. I would love to see kids friendly / approved dishes....... as well as healthy ...... quick and easy to make recipes as many moms know early morning packing lunch boxes will be a huge task. 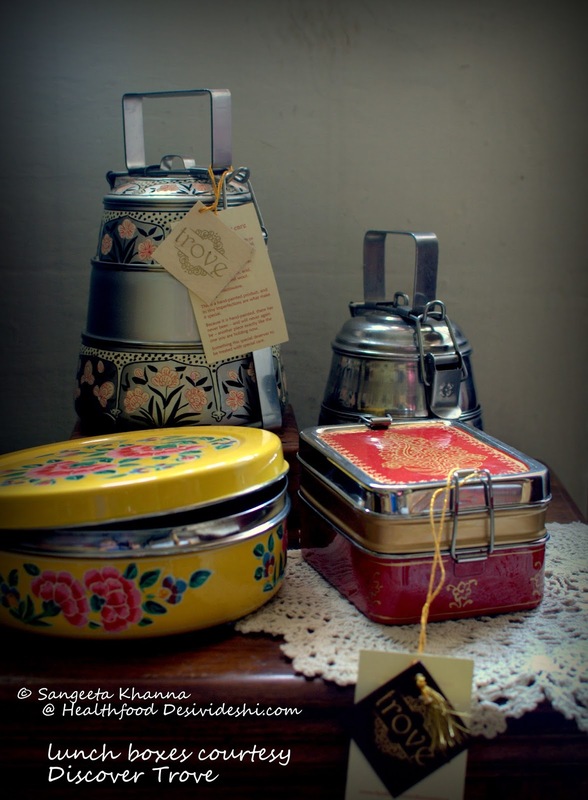 Thanks Sharanya, this series is about lunch boxes for adults. I will talk about kids lunch boxes a little later. Thanks for the suggestion. My husband carries his lunch box everyday. In Kolkata I dont pack cut fruits as they dont have access to their office fridge so pack a whole fruit as evening snack. generally I pack roti, sabzi, salad, curd or Rice, sabzi fish curry. Generally prefer to use fish fillets for his lunchbox which makes it easier for him to eat with spoon at his desk when he is pressed for time. I set curd in small steel containers for him which he carries almost everyday. For curd I avoid metal containers though steel is nonreactive. But I feel glass works better, may be a mind block on my part. Packing lunch is new to me, I worked previously in a company that provided lunch in the cafe. I pack a variety of things - usually 2 sabzis and rice/roti/quinoa/cous cous. I would love more options that are easier to handle and eat (maybe filled parathas, wraps, salads that are filling), etc. Currently I am using the tupperware lunchbox which is good because it doesn't take up much space and is leakproof but re-heating is a pain. I have to transfer everything to a ceramic plate at work before microwaving. Thanks Nags, yes more options of roti/paratha wraps and rolls are planned in this series so stay tuned. There will be loads of salads and 'full meal yogurt options' too, hope a few things will be useful for you too. Love the lunch boxes but the contents are even better! Thanks, Sangeeta! Thanks for the complement Corinne :-) Good to hear from you. Thanks Sonal. I will try and post some one pot meals in the series. Yes I feel one pot meals are very convenient but personally I do like some change in taste during a meal so a separate container of yogurt or plain salad works for me. Dear Sangeeta, did you write this post specially for me :)? Though I do not pack dabbas for my ' young professional and proud new owners of their own living spaces' kids who are passionate about fitness and also understand that good nutritious homecooked food is an essential part of the health equation and are willing to get their hands dirty or train their help,I am always wracking my brains as to what to suggest to them.It is a new age order -tasty,fast cooking, easy to make food that can be stored in flat boxes for carrying convinience and that stays well for atleast a 4-5 hours! So this post is Godsent !! This is what we do so far - fruits that stay well and can be carried easily cut or whole -anar , grapes , papaya , apple and banana; home made hummus, garlic-peanut-red chilli chutney layered sandwiches for a snack , salads with oregano -vinagrette/ lemon juice- mint dressing,roasted melon-sesame seeds, roasted nuts mix-peanuts/walnuts/pinenuts/almonds/cranberries and salt-pepper seasoning carried seperately to be added just before eating . regular seasonal sabzi and roti for meals. home made masala lassi / ice tea to drink. Now comes the packing -tupperware dishes smell so highly dissatified and have been looking for flat steel tiffin boxes with partitions or two layers to pack roti and sabzi seperately( the flat tiffin box from trove is just what I want ...hint ,hint;)). Have recently acquired yera glass dishes with plastic airtight lids , both round/square shaped ones quite good for servings for one. What I would love to read further is new ideas for chatnis with oriental or fushion flavors and salads. Cheers and keep the good work going ! Thanks Navneet, so good to hear from you. Yes I agree fitness and health conscious people who spend a lot of time commuting to office and then long hours at work too, need to carry a lot of eatables and drinks because otherwise they wont be able to eat well. Your posts are really inspiring to make your lunch boxes look interesting! Thanks Acefoodie. I love burrito bowls with hot pico de gallo, very satisfying for the Indian palate. Will try and include a burrito style lunch box in the series. Thanks for suggestion.